Less than four months after Snapchat introduced its Snappables platform, Facebook has met the challenge with its own AR gaming feature that surpasses the originator. 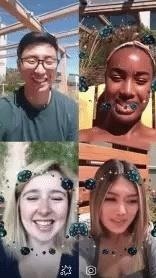 Rolling out to users on the Messenger app for iOS and Android starting Wednesday, multiplayer video chat AR games now enable up to six users to play in real time. By comparison, Snappables requires users to record their experience and send it to others to take their turn, though Snapchat does include AR experiences in group video chats. "For the moments when we can't be together IRL, Messenger video chat helps you connect in real time with the people you care about most. Chatting face-to-face live makes all the difference when you have exciting news to share, you need a study buddy for a big test, or you simply want to pass the time together," wrote Nora Micheva, Facebook's product manager for Messenger, in a blog post. "Today we're excited to make connecting with your friends in video chat even more fun — and competitive! — with multiplayer video chat AR games. You can play with up to six people at a time, making the gaming experience much more interactive and social." The games are activated via the video icon in any chat in the latest version of the Messenger mobile app. Users tap the star button and select one of the available games, and other users will be notified that it's game time. Two games will be available at launch. "Don't Smile" is an AR take on the classic staring contest, where the winner is the one who can hold a serious face the longest. 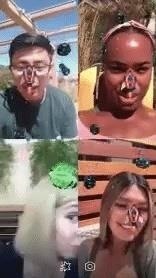 The other launch game is "Asteroids Attack," where users are challenged to guide a spacecraft in AR with their noses (talk about some innovative uses for facial recognition). Other forthcoming experiences include "Beach Bump," where participants pass around a beach ball (and wish they were actually at the beach instead), and "Kitten Kraze," where players match (probably adorable) cats. Moreover, the platform is supported by Facebook's AR Studio, so expect more games from third-party creators in the future. Facebook often gets shade for copying Snapchat. But in this case, while Snapchat has already moved on towards monetization for its game platform, Facebook has managed to not just copy Snapchat, but actually ship a feature that is superior to the original concept. In the game of AR feature one-upmanship, score one for Facebook.